"Healthy and full of flavor, sriracha honey Brussels sprouts are crispy and coated with a delicious sweet and spicy sauce. Perfect side dish for any meal! Top with a drizzle of sriracha sauce if desired." Preheat oven to 400 degrees F (200 degrees C). Spray a rimmed baking sheet with cooking spray. 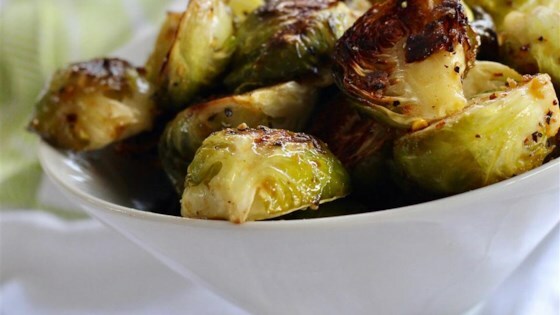 Combine Brussels sprouts, olive oil, salt, pepper, and red pepper flakes in a bowl; toss until coated. Arrange in a single layer on prepared baking sheet. Roast in the preheated oven until Brussels sprouts are golden brown and tender, about 25 minutes. Mix honey and Sriracha sauce together in a small bowl until combined. Place roasted Brussels sprouts in a bowl. Drizzle with honey mixture; toss until well coated. Too hot for me and the flavor wasn't that spectacular. I'll look for a different recipe. These are absolutely delicious. The only thing I would change if you don't like hot foods, is half the sriracha sauce. Great flavors for Brussels Sprouts. I’ll usually also add some soy sauce and balsamic vinegar to kick it up a notch.